Nothing brings people closer together like a bloodcurdling scream. The team behind Bridgeport Gore Grounds brings a new horrifying twist on your nightmare with a Valentine-themed haunted house unleashing Demons, The Undead and Blood Sucking Vampires. The cast and crew will transform its Halloween haunted house into a Haunted Valentine Massacre on Feb. 14th, 15th and 16th. General admission tickets range from $10 - $20 online. Save money with online Group Rates. SpeedPass tickets to skip the line are also available for additional fees. A. 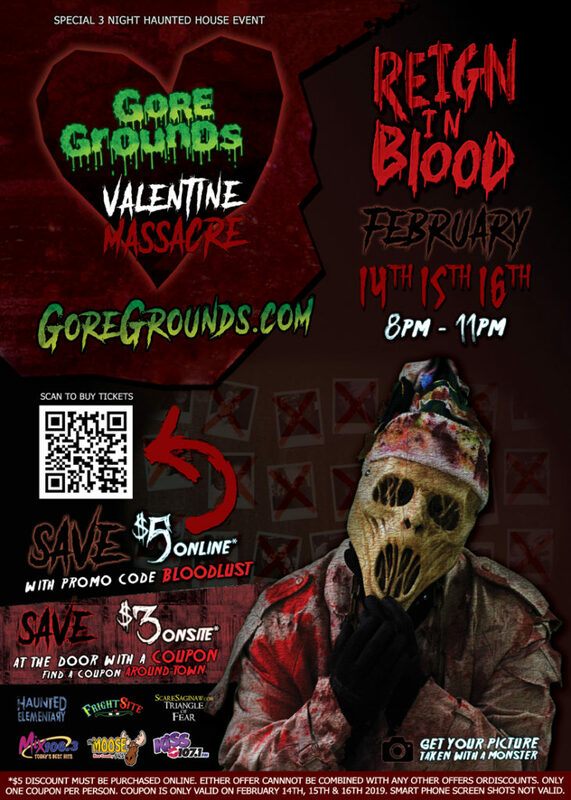 A Valentine Massacre is Bridgeport Gore Grounds' unique take on the Valentine Holiday. Nothing brings people closer together like a bloodcurdling scream. Grab a date or your significant other and make your way to the ULTIMATE DATE FRIGHT NIGHT this Valentines Weekend. A. YES! We ALWAYS aim to make you scream! A. You can purchase tickets at https://app.hauntpay.com/events/A-Valentines-Massacre. Tickets are being sold in limited quantities per night, so we encourage you to buy your tickets in advance. SPECIAL: Use the code ‘BLOODLUST’ at checkout for $5 off your purchase of a single ticket.